What’s in the Clam Bag? Shellfish (oysters, clams, mussels, etc.) provide a favorable environment for the coastal and estuarine waters in which they are grown. In turn, shellfish farming can provide local communities with a variety of ecosystem services, whose value can be quantified. 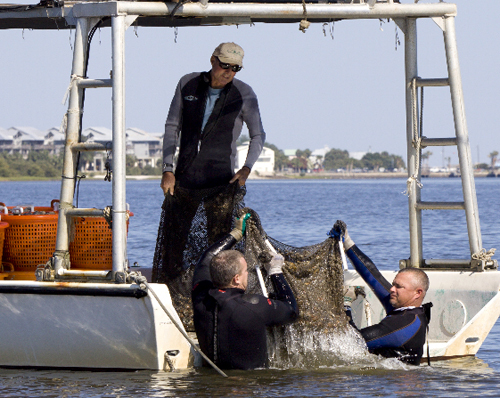 The results of a University of Florida (UF) study conducted in 2015 demonstrate the unique sustainability of Florida hard clam aquaculture. Three environmentally-beneficial ecosystem services (water filtration, nitrogen removal and carbon storage) provided by clam farming were examined. Efforts focused on assembling values for ecosystem services specific to clam culture. Measurements, particularly for harvest-sized clams at water temperatures found in Florida, are not available through the literature. To address these information gaps, pertinent laboratory measures were determined. Read further for a description of these ecosystem services, their value estimates, and how they relate to Florida’s “green” clam culture industry. The transformation of a set of natural resources supplied by ecosystems into beneficial goods and functions that humans value. An ecosystem is a complex system of plant, animal, fungal, and microorganism communities and their associated non-living environment interacting as an ecological unit. A single littleneck-sized clam can filter 4.5 gallons of seawater per day. As clams feed, they create currents that move water in and out of the animal. Tiny moving cilia (hair-like structures), which cover the gills, pump water through the clam, drawing it in the incurrent siphon. Suspended particles in the water are captured by the gills and moved to the mouth for ingestion. The cleared water is then ejected from the excurrent siphon. By this very act of feeding, clams filter phytoplankton (microscopic algae or plants), microorganisms, and detritus. In doing so, they improve water clarity by reducing sediment loads and turbidity and removing excess nutrients from inshore coastal waters. Clearer water allows more sunlight to penetrate, which aids in the growth of important seagrasses and increases oxygen. “Filter feeding” clams may also potentially prevent harmful algal blooms. In this time lapse video, the clam’s water-cleaning efficiency is demonstrated by placing 24 littlenecks in a 2.5 gallon aquarium containing algae (density of 396,000 cells/ml). Compare what happens, over 100 minutes, in the aquarium with clams (right) and the aquarium without clams (left). A single littleneck-sized clam can remove 0.09 grams of nitrogen from the water. Clams play an important role in the cycling of nutrients, including nitrogen (N). Clams do not absorb nitrogen directly from their environment, rather they feed on naturally-occurring phytoplankton, which use dissolved inorganic nitrogen, available in the water, to grow. Thus, clams incorporate nitrogen from their food into their tissues and shells. 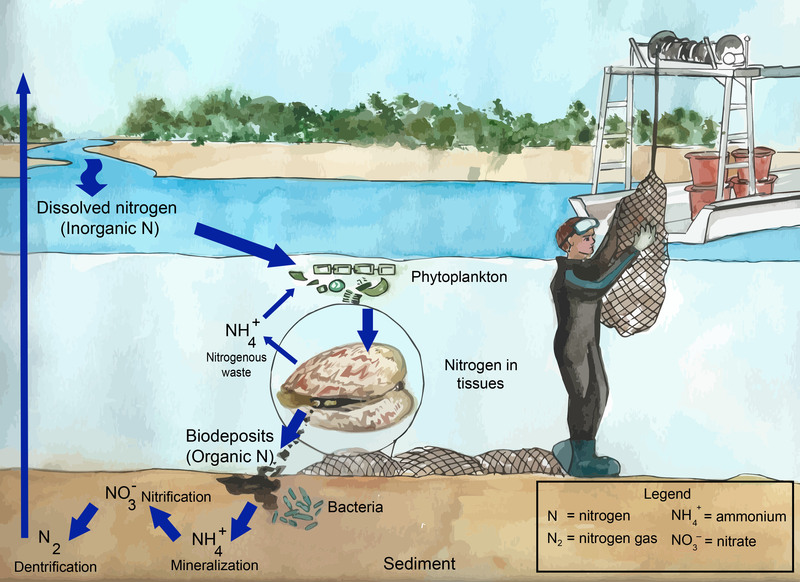 When clams are harvested, the accumulated nitrogen is removed from the water. Clams also play an important role in the cycling of nutrients, including nitrogen. For example, clams release nitrogenous waste (urine) that can be used by phytoplankton as a source of nitrogen. In addition, some of the nitrogen filtered from the water by clams is deposited to the sediment as feces and pseudofeces (rejected food particles). These biodeposits are decomposed by bacteria, which transform the nitrogen to a variety of other forms, including ammonium (NH4+), nitrate (NO3-), and nitrogen gas (N2). A single littleneck-sized clam can store 2.76 grams of atmospheric carbon. Clams convert carbon (C) into calcium carbonate (CaCO3) shell. The carbonate used by clams is primarily derived from atmospheric carbon dioxide (CO2) dissolved in seawater. Thereby, the shells of cultured clams provide a long-term carbon sink. Clams not only store carbon in their shells and tissues, but also process it while they are growing. Just like other animals, they produce carbon dioxide as a waste product of respiration. 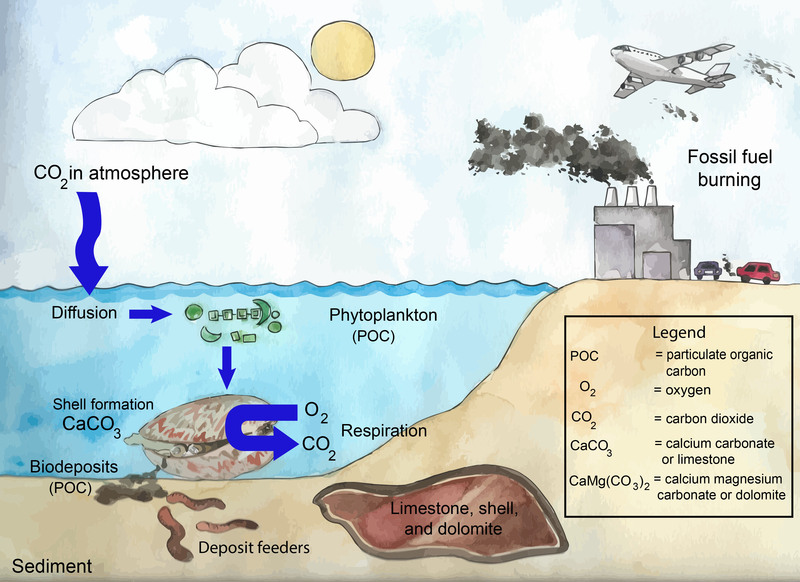 In addition, the carbon (particulate organic carbon, POC) deposited in the sediments as feces and pseudofeces is consumed by a variety of organisms, such as worms, brittle stars, and other deposit feeders. Some carbon will remain locked in the sediments and can persist indefinitely as shell fragments, limestone (CaCo3), and dolomite (CaMg[CO3]2). In contrast, the carbon contained in most plant and animal tissues returns to carbon dioxide within a few years. The contribution of the Florida hard clam industry to the mitigation of nitrogen and carbon extraction was assessed by UF economists. The costs that would be incurred to replace the industry’s services with the next best alternative were calculated. For nitrogen removal, replacement cost values were based on the costs of wastewater treatment plants in various Florida cities. Values per pound of nitrogen removed, ranging from $3.44 for Clearwater to $5.22 for Fort Myers, were based on land values and cost of living, factors that affect the cost of wastewater treatment plants. For carbon sequestration, the creation and maintenance of pine tree plantations was used as a possible alternative to clam production. Costs included pine production, as well as the value of the land in an alternative use. In counties with high agricultural, commercial, or urban land values, this opportunity cost of utilizing the land as a pine plantation was high. The highest values ($119.01 per ton) were estimated for Collier County, while the lowest ($0.71 per ton) costs were in Franklin County, primarily due to lower land values in the more rural county. Due to clams’ filtration capacity, 544 million gallons of seawater were filtered by the statewide production of 136 million clams. Through the harvest of 136 million clams, over 25 thousand pounds of nitrogen were removed and 760 thousand pounds of carbon were stored from the coastal environment. The economic value of these benefits was estimated at $99,680, which represents the public good value that the industry generates to Florida citizens at no cost. This estimate was about 1% of the farm gate value of clam sales ($11.9 million) in that year. These results demonstrate the important contribution of hard clam culture to coastal ecosystem services. Findings on clam farm sustainability can benefit growers, wholesalers, and retailers by allowing them to inform buyers and consumers that shellfish aquaculture is a “green” industry and, in fact, provides ecosystem services. Consumers will benefit by being made aware of the environmental benefits of sustainable shellfish aquaculture. The entire project report, “Green” Clams: Estimating the Value of Environmental Benefits (Ecosystem Services) Generated by the Hard Clam Aquaculture Industry in Florida, can be viewed here. As part of this project, a review of journal articles and posters, working papers, and dissertations pertaining to methods used to value ecosystem services provided by shellfish was conducted. For tables outlining species, study area, ecosystem services valued, methods, and valuation per unit of service, click here. The Clam Farm Benefit Calculator allows Florida growers to make a simple estimation of the environmental benefits their farms provide on an annual basis to the coastal waters in which their crops are grown. This tool can be accessed here. This work was a collaboration of University of Florida IFAS research and extension faculty: Dr. Shirley Baker, School of Forest Resources and Conservation; Dr. Kelly Grogan and Dr. Sherry Larkin, Food and Resource Economics Department; and, Leslie Sturmer, Cooperative Extension Service. Graduate students who contributed to this project include Angelo (Jason) Spadaro and Jorge Avila. Funding for this project was obtained from the Florida Department of Agriculture and Consumer Services through the 2014-15 Florida Aquaculture Program (contract #00094300).